Auto claims tend to spike in winter. Getting your vehicle ready is key to avoid problems once the temperature drops. When it comes to car maintenance, every detail counts. Here are five things you can do to protect your vehicle and take on the winter safely. In the fall, start by giving the inside and outside of your vehicle a good clean. Then check the paint. If there are chips in the paint that leave the metal exposed to the elements, you will need to cover them to prevent rusting. It’s easy to touch up the paint yourself—just pick up the right paint colour from an auto parts retailer. It is also recommended that you give your vehicle a carwash several times during the winter to prevent salt and calcium build-up from damaging your vehicle. 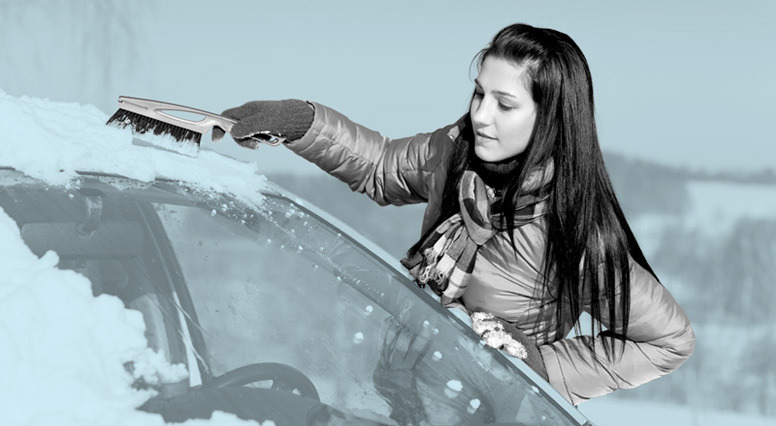 Before the first snowfall, make sure you have a brush, a scraper and a shovel in your car. Switch the summer carpets for winter carpets to protect your vehicle better and keep your summer carpets clean for warmer months. Also replace the summer windshield wipers with winter ones that are more effective and sturdy. Your winter wipers are less likely to break under the weight of the ice and snow and will increase visibility in winter storms. Antifreeze prevents your windshield wiper fluid from freezing in the reservoir during a cold spell. Make sure you always have enough antifreeze. You can always test your wiper fluid using an antifreeze tester that you can pick up for a few dollars at an auto parts retailer. To drive safely in cold temperatures, you should install your winter tires once temperatures drop consistently below 7° Celsius. In Quebec, winter tires are mandatory from December 1 to March 15. In most other provinces and territories, they are highly recommended, but not mandatory. When you are having your tires switched over, ask your mechanic if they are in good enough condition to get you from point A to point B safely. Book an appointment sooner rather than later, because the first snowfall sometimes comes as early as the end of October. To drive with peace of mind this winter, schedule your car for a pre-winter inspection at your garage. During the inspection, your mechanic will check the condition of your brakes, spark plugs, fluid levels and thermostat, as well as your car battery. If the battery charge is low, better to change it before cold winter temperatures put it to the test. Fall is also a great time for an oil change so the moving parts are properly lubricated and don’t rub together. Once you do these five things, you are now ready to tackle the winter. Also don’t forget to drive according to winter road conditions. Always keep the proper distance from the vehicle ahead of you and cut back on distractions.